Today at Pajamas Media.Com, I discuss the latest stratagem of the greenhouse lobby to protect EPA’s purloined power to dictate national climate and energy policy: Sen. Max Baucus’s (D-Mont.) amendment to the small business reauthorization bill. 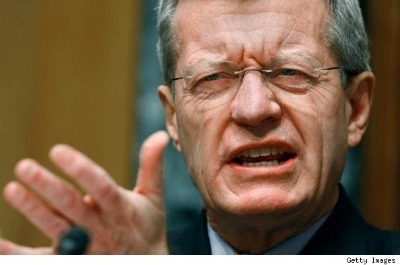 The Baucus amendment would essentially codify EPA’s Tailoring Rule, which exempts small greenhouse gas (GHG) emitters from Clean Air Act (CAA) permitting requirements. That may seem innocent enough. However, if enacted, the Baucus amendment would also codify the ever-growing ensemble of EPA climate initiatives of which the Tailoring Rule is only a small piece. EPA’s current and probable future climate regulations include GHG/fuel-economy standards for all categories of mobile sources (cars, trucks, marine vessels, aircraft, non-road vehicles and engines) and GHG/energy-efficiency standards for dozens of industrial source categories. Congress, however, never authorized EPA to determine fuel economy standards for motor vehicles, much less dictate national policy on climate change. The Baucus amendment would put Congress’s legislative stamp of approval on EPA’s end-run around the legislative process. The amendment has almost no chance of passing in the GOP-led House of Representatives. However, it does not need to pass to perpetuate EPA’s shocking power grab. All it has to do is peel off enough votes in the Senate to prevent passage of the Inhofe-Upton Energy Tax Prevention Act. That bill, which is almost certain to pass in the House, would overturn most of EPA’s current GHG regulations and stop the agency permanently from promulgating climate change policies Congress never approved. Whether the Baucus amendment is adopted or just blocks passage of Inhofe-Upton, the U.S. economy will be exposed to the risk that EPA will be litigated into establishing national ambient air quality standards (NAAQS) for GHGs, and to the risk that EPA will use BACT (“best available control technology”) determinations and NSPS (New Source Performance Standards) to restrict America’s access to affordable, carbon-based energy. Sadly, more than a few Members of Congress today seem to believe that the greenhouse agenda is more important than any constitutional principle that might interfere with it. How Senators vote on the Baucus amendment will be a test of their respect for the Constitution.